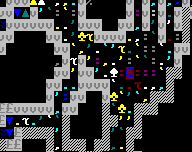 Being a chronicle of the second year of Gravespoon the Angry-Fissure, dwarf fortress. 1st Granite, 134: I have created a bold plan. We will extend the fortress upwards, into the peak of the volcano. I do not know why. Perhaps the reasons will become clear later. 10th Granite, 134: There are many cats. 13th Granite, 134: I have ordered the underground cavern be breached and harvested for its fine woods. The Gods save us all. 3rd Slate, 134: Vabok the woodcutter will not go in to the cavern. I do not blame him. We will store our wine in pots instead. 7th Slate, 134: Many migrants have arrived. There are still no bedrooms. There are still no beds. There are still no woods. I despair. 8th Slate, 134: Vabok has changed his mind. I have unlocked the door to the cavern, and we will build many fine beds from the tower-cap woods he brings. 16th Slate, 134: There is a rat in the fortress. It is taking the booze. 24th Slate, 134: The rat is wreaking havoc in the fortress. It must be destroyed. I will have many fine battleaxes forged. 8th Felsite, 134: The rat will not let us sleep. The rat will not let us drink. The rat will not let us mine. There is rocks everywhere. It rains. 15th Felsite, 134: Kel Cagthzst, a peasant, has come to me. He wishes to form a militia. I tell him no. He tells me he has already done it. They call themselves The Romantic Roads. I do not trust them, but perhaps they can kill the rat. Perhaps we can finally sleep. 20th Felsite, 134: Traders have arrived. They are elfs. Kel wishes to train on them, but I say no. We will give them rocks, and they will give us foods and booze. This is how it works. 23rd Felsite, 134: Kosoth Otingsibrek, the kitten, has slain the rat. He will be hailed as a hero, and our grandchildren's grandchildren will sing songs of his glory. 2nd Hematite, 134: We shall build a well above the irrigation channel. It will be worse than drinking booze, but better than drinking muds. 12th Hematite, 134: I do not like talking to the elfs. But I took their woods, and all their nasty elf foods, which I will have brewed into booze. 23rd Hematite, 134: The well is almost finished. Olon has locked himself in one of the magma forges, and is drawing pictures. I tell him, Olon, you are a brewer, you do not know how to use the forge. Olon grunts and draws faster. I am worried. 27th Hematite, 134: What is Olon building? He will tell nobody. I am worried. 4th Malachite, 134: Olon has forged a mighty battleaxe. Now he is calling himself a smith. It is made of silver. I tell him, Olon, you cannot make an axe from silver. You are a brewer. Olon ignores me. 13th Malachite, 134: The well is finished. It is of gold and obsidian. It is glorious. The bedrooms are also finished. They are of rough stone and mushroom bits and filthy elf woods. They too are glorious. 17th Malachite, 134: More migrants are here. It is clear that news of our glorious well and our glorious bedrooms is what has brought them. 13th Galena, 134: Many small things have happened. The passage to the cavern is trapped. The floor of the hall is smoothed. More bedrooms have been dug. I have ordered the gold smelted. All is going too well. Something must be amiss. 15th Galena, 134: There are no crops planted. Without Plump Helmets we will surely starve. Something is wrong. This is good. 6th Limestone, 134: Autumn is upon us. We are digging downwards for minerals. We are digging sideways for bedrooms. We are digging upwards for no reason at all, and with great difficulty. 16th Limestone, 134: Kel wishes to recruit more dwarfs for his Romantic Roads from the new immigrants. I tell him no. He tells me he has already done it, and that he needs the passage to the barracks widened. 21st Limestone, 134: The kitchens have prepared a lavish food, of cat meats and plump helmet sauce. It is delicious, but I prefer booze. 2nd Sandstone, 134: More migrants have arrived. I wish they would stop. 5th Sandstone, 134: The migrants saw a hive of honey bees on the way in. Perhaps I could have a hive built, and we could drink some booze that was not made from plump helmets. 15th Sandstone, 134: The hive is built. I will have it put outside the entrance. I will find a dwarf to find the bees and take the bees and put the bees in the hive, and we will have mead. 17th Sandstone, 134: I am concerned that should a seige come, we will lose the bees. I will not have our bees fall into the hands of elfs. I will have walls built. The bees must be defended. 22nd Sandstone, 134: The hive is safe. Soon we will have many bees. Perhaps even as many as we have cats. 2nd Timber, 134: Winter is coming. I will have gems cut for next year's traders, and I will have all the crops planted. 4th Timber, 134: I would like us to be better prepared, to defend the bees from elfs. I think we should have crossbowmen. Kel tells me, no, his squad can do this alone. I tell him, no, you can not. Kel is upset, but I do not care. I will have my marksdwarves. 5th Timber, 134: This was a poor choice, so late in the year. We will need additional storage space, and a supply of bones, and a new workshop, and targets, and many other things. And then we will need volunteers. 6th Timber, 134: Tun the Fisherdwarf has stopped talking, and is living in one of the workshops, as Olon did. I tell him, as I told Olon, Tun, you are a fisherdwarf. You cannot make crafts. Tun ignores me. 12th Timber, 134: Tun is calling himself an engraver now. Tun, I tell him, what engraver makes a scepter of all alumite? Tun ignores me. Perhaps you can help to finish the beehives, I tell him. He keeps ignoring me. 13th Timber, 134: What use is an alumite scepter? 15th Timber, 134: The dwarf caravan has arrived. Hopefully they have woods, and booze. 16th Timber, 134: A horde of troglodytes is in the caverns. It is attacking Kosoth the weaver. He will probably die. 17th Timber, 134: Kosoth is dead. I have locked the door to the caverns, but they do not seem to be coming closer. I hope they do not get in to the fortress. 22nd Timber, 134: The dwarfs in the caravan have brought many fine woods, though they are not happy about it. They laugh and call us elfs. But it is good, since the fungiwood cavern is too dangerous. Poor Kosoth. 1st Moonstone, 134: Winter is upon us. Before the caravan leaves I have traded for some more foods, and more seeds. I hope we will not need them. 13th Moonstone, 134: I have put in my requests for the caravan next year. More filthy elf woods. Crossbow bolts. As many barrels as they can carry. In return they want earrings and crowns and handwears and bracelets and drinks. And it has started to snow. 17th Moonstone, 134: The archers have begun training, in the room-which-is- slightly-above-the-room-which-the-militia-use. I do not see how five dwarfs can train on one target made of rocks in an empty room, but I say nothing. 21st Moonstone, 134: There is a hematite vein off the storeroom which somehow I have missed. I will have it exploited for its fine metals, for the glory of the fortress. 24th Moonstone, 134: The fortress rings with the sounds of picks and smelters. I lie awake on my bed and wonder things. Where do cats come from? Why are they the colour of iron? Who drank the last of the dwarven ale? 9th Opal, 134: Today, Urist Bekarmorul gave birth while carrying a plump helmet to the stockpile. 13th Opal, 134: They tell me the vein has not only hematite, but copper and sphalerite too. I do not understand many of these words, but I nod at the miners and tell them to keep digging. 16th Opal, 134: Kel, the militia commander, has also given birth. Kel, I say to her, I thought you were male. Kel tells me no. Kel, I say to her, you cannot lead a militia while holding a child. Kel disagrees. 20th Opal, 134: The first of the beehives is ready for harvesting. By spring there will be mead in the halls. 7th Obsidian, 134: I tire of this endless winter. 14th Obsidian, 134: We continue to mine the metal vein off the storeroom. The fortress fills with the smell of copper. Perhaps this is what has driven yet another dwarf to withdraw from society. This time it is Sarvesh, captain of the archers, who has no skill with craftsmanship of any kind. I worry. 24th Obsidian, 134: It is an amulet. Sarvesh, I tell him, We need battleaxes, not granite amulets. 28th Obsidian, 134: I have designated a hospital in the bunk room, but I fear I will not see it through to completion. 1st Granite, 135: My stewardship of these dwarves is at an end. They may not be happy. They may not be healthy. They may not be prosperous. But they are alive. Taking over another person's fortress is like trying to live inside someone else's house: It might look superficially similar, with the knives and forks in the top drawer, but the deeper you dig (heh.) the more you realise that everything is totally wrong.